MILWAUKEE (AP) — Dwyane Wade’s last dance went back to college. The Miami Heat guard — who has dubbed his 16th and final NBA season “One Last Dance” — was the guest of honor at Marquette’s game against Providence on Sunday. Wade starred for the Golden Eagles during the 2001-02 and 2002-03 seasons, leading Marquette to the Final Four in his last year of college before he jumped to the NBA. “I think my younger self would be proud of me,” Wade said. The big surprise came at halftime, when Marquette and some members of Wade’s inner circle stunned him by having his two oldest sons and the nephew that he’s raising come onto the court. Zaire Wade, his oldest, presented his father with the Marquette letter jacket that he never got as a collegian — and Zion Wade, the younger son, gave him a baby-sized jacket for the family’s newest addition, Kaavia James Union Wade. Wade thought his kids were in Miami, unable to attend because of conflicts with their own basketball schedules. 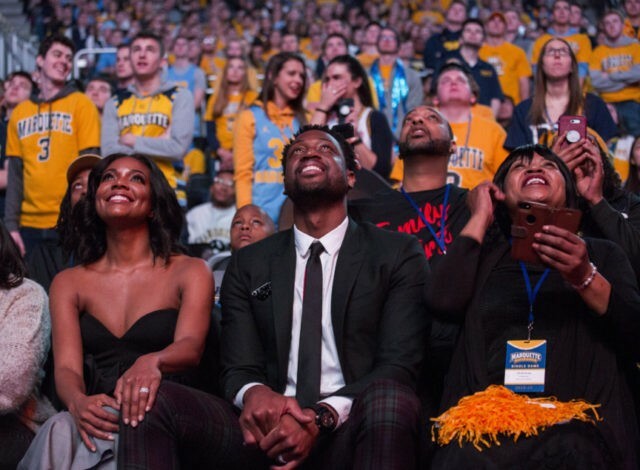 Flanked by his wife, Gabrielle Union, on one side and his mother, Jolinda Wade, on the other as they sat in baseline seats adjacent to the Marquette bench, Wade was the recipient of several tributes during the game — some of them shown on the video screens during timeouts, and another of the on-court variety during halftime. Travis Diener and Jae Crowder were among the former Marquette players who sent well-wishes via video, as was Georgia coach Tom Crean, who coached Wade at Marquette. Wesley Matthews, another onetime Golden Eagle, did the same and also was at the game since he and the Dallas Mavericks will be back in that building on Monday to take on the Milwaukee Bucks. Steve Novak, a college teammate of Wade’s, was in the crowd.